Is it just me or is everyone on the Internet telling you how to make the perfect hard-boiled egg? Yes, even me. Even Dexter was giving those eggs the side-eye. Is it so hard to give me gorgeous eggs JUST ONCE?! Sheesh. For the record, I think most hard-boiled eggs turn out like this and I wanted to keep it real and show you just how these badboys one-upped me by refusing to release their blasted membrane. My hope is that one day, when you read a chirpy tutorial, and see the amazing pics that make you feel inadequate, you’ll know what really happens more often than not. Okay so I know there are a dozen tips on how to boil and peel eggs out there but the only one I know to work most of the time is to buy your eggs a week -10 days in advance (like we all plan that far ahead). I just keep a special hard boiled egg carton. Eggs have a very long shelf life so they will still be fine. There is your free, for what it’s worth tip for the day. Good luck. HA! Yep, I utilized that tip. Always use old eggs. These must have been old cantankerous eggs. Dang-blasted. But, I appreciate you wanting to help a granny out. Thanks! I have not tried it myself, but I have lots of friends who had fantastic luck with steaming eggs at Easter. Mommy fail….we never decorated eggs at Easter. Time just got away from us. But, I did buy a dying kit on clearance and soon it will hopefully be a Saturday afternoon activity. I just heard about steaming and am gonna give it a try. Dying eggs anytime is good fun! Huh, who knew (other than you of course!)? These were old eggs, peeled in cold water, right after boiling. Eep! Well of course I have to throw in my opinion! I boil eggs every week for Grampy’s tuna/egg sandwiches that he want for lunch (EVERY DAY! He is so weird! I can’t eat anything that often! but it does make life easy). I don’t use old eggs – didn’t know I was supposed to. I do put them in ice water when they are cooked so that the yolks stay yellow. Then when I want to peel them, which I sometimes don’t do the same day, I run them under hot water. It seems to make them contract a bit in their shells and they peel pretty good. Never do they all come out perfect but pretty close. Worth trying! Definitely worth trying because….DID YOU SEE THE HORRIBLE NO GOOD EGGS?! Lol! Yes, I did see them! 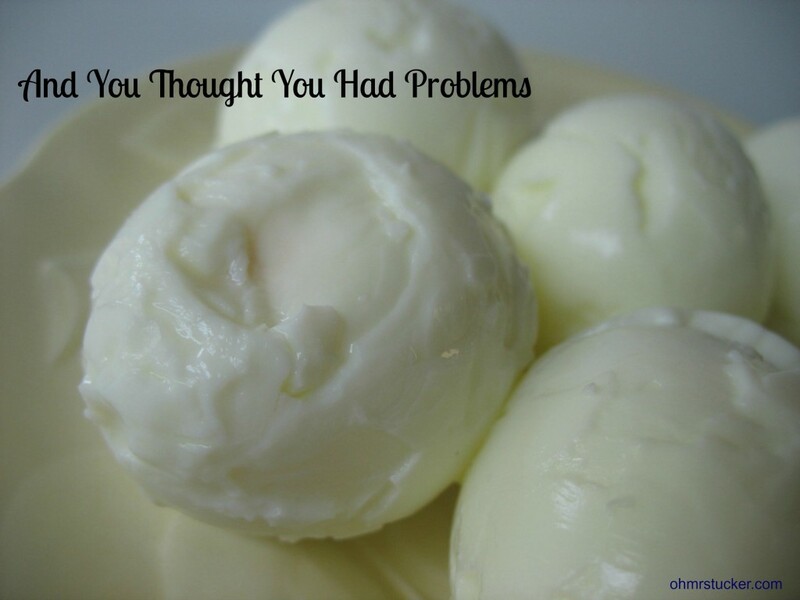 I once accidentally froze a peeled hard boiled egg. About the only thing uglier! I used it in one of those photo games where you ask “what is it?” No one knew! All filling ain’t too bad, looking at these pics! Glad I could give you a laugh. Have eggs that often look like yours so please don’t feel you are alone. It seems like I’ve tried all the tips, but you never know what you’re gonna get. Thanks for the new tip! I shocked those eggs like nobodies business yet still they mocked me! I thought it was truly nuts that people were posting tutorials on boiling eggs — until one of my daughters (nearly 30 years old!) called to ask me how to make hard-boiled eggs. Could. Not. Believe. It. Guess I didn’t teach all I was supposed to. Thankfully, you can find ANYthing on the web. Thanks for linking to the GRAND Social! Teehee …. I so am laughing so hard!! That is so how my egg’s always turn out. Sorry about the eggs, but thanks for the laugh! Always happy to give a laugh! Haha, you sound like a fun person to know. OMGosh! Best comment of the day! Thanks for that! Heavily salt the water you boil them in and they will peel much easier! This is probably the #1 tip for this post! Okay so I’m a little late on a comment here but I found if I peel starting from the top (pointy end) it breaks the membrane (uck) and they always peel flawlessly. so far..everytime I peel them that way it works. The membrane has to be broken, that sounds familiar, in order for the shell to lift off. I always try to break the membrane, and I usually don’t have eggs that look like this….just thought it was funny. The only reason we boil eggs around here is to turn them in to not pretty food. At least I am not the only one that has eggs turn out like this lol..
Ha! I appreciate the bad-lookin’ egg kinship. Also, on behalf of my family to yours, thank you for your service. Ha! As I write this comment, eggs are on the stove. I advised them to shape up…peel right! I have the answer!!! Put about 1 tablespoon of baking soda in the water before you boil the eggs. It has something to do with the ph of your water. I’ve tried everything (old eggs, ice water, etc) and nothing worked until I tried this. Oooo, I haven’t tried this one yet. I’ll do it and let y’all know. I can’t believe everyone has a method that works best for them, but there isn’t one universal method that works! I hard boiled eggs this morning, and the one I cracked open actually worked. I’m not sure why sometimes they work and sometimes they stick; however, I’ve had better success by running cold water over the egg and then cracking the ends first. I typically employ this method as well. No go on this batch. 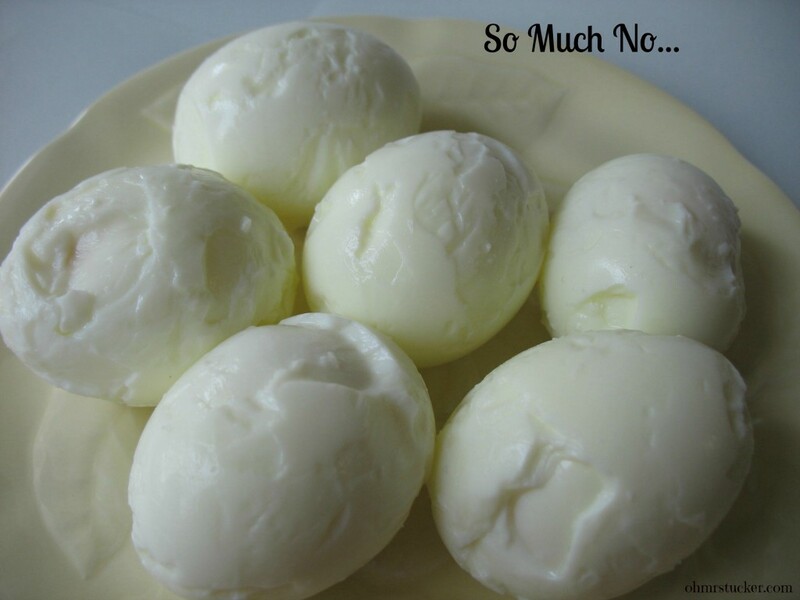 I have boiled eggs the same way for years… sometimes they shell perfect, sometimes not. found you on cookn’ for seven dwarfs savory and sweet Sunday. Same here. Thought it would be funny to show the real deal when eggs go bad! You are hilarious!! I think getting perfect to peel boiled eggs is all about “how you hold your wrists when you put them in the pan.” My husband says he can’t figure out why he can never peel an egg without losing half of it so I bought him some of those AS SEEN ON TV “EGGIES.” They are little plastic egg shaped forms that twist apart in the middle. you open them up, lightly oil the inside, break the eggshell and put the raw egg inside and screw the top on. You them boil them for 7-8 minites and then run under cold water until cool. When you take the form off, you have a great boiled egg. Works for him and he gets the whole egg. Whoa…never heard of that product. Made me laugh, though! I have never made a successful batch of hardboiled eggs. 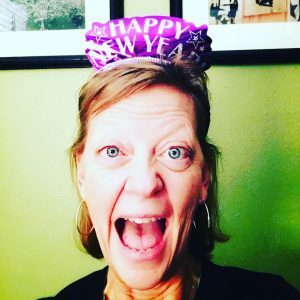 I have tried with every blog/Pinterest trick known to wo(man). I can make a soufflé but not a stinking egg!! Oh I have been there! Hahaha! At least there wasn’t a party these eggs had to show up to…just my fridge. So, what you’re saying is that you figured out a way to add fiber to your morning egg. ha!